1 GHz Intel Pentium processor or equivalent, 512MB of RAM, 250MB of free disk space. 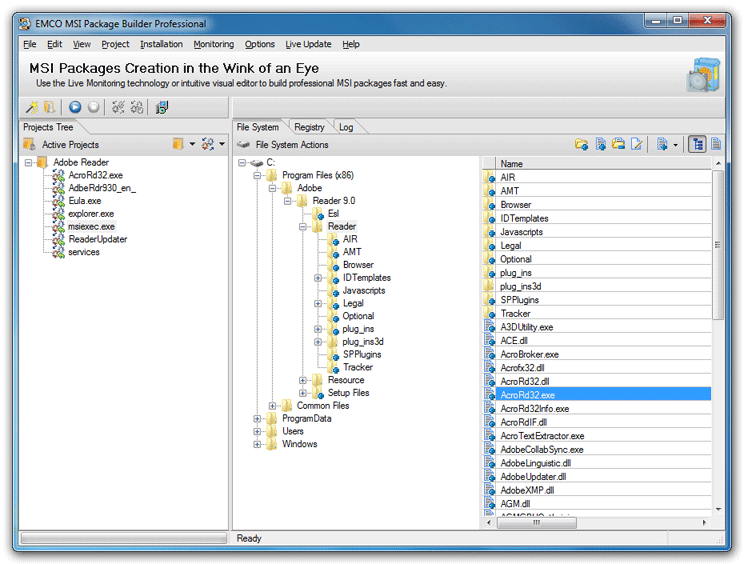 MSI Package Builder is a tool that allows you to create MSI packages using easy visual interface and also customize and repackage third-party installations into MSI format. You can use EMCO MSI Package Builder to produce MSI packages ready for silent deployment and repackage non-silent EXE installations to silent MSI packages in order to prepare them for automatic remote deployment through Group Policy and other tools. EMCO MSI Package Builder is an advanced MSI authoring tool that significantly simplifies MSI creation and EXE to MSI repackaging tasks. Easy visual editor allows you to create MSI package from scratch in minutes, but the most advanced functionality of the application is repacking of third-party EXE installations into MSI. Thanks to the unique Live Monitoring technology you can repackage even complicated setups quickly and easily and get the most accurate repackaging result. * Intuitive visual editor that allows to configure file system, registry, shortcuts, environment variables, services installation changes. * Automatic MSI project and MSI package generation by tracking file system and registry changes using Live Monitoring technology. * Generation MSI packages for x86 and x64 platforms with an ability to specify various installation options. Create FAQ web pages and text files. The easiest Java Swing GUI builder generating human readable Java code. Finally, Everything you need! to organize music pastors & worship leaders! 3DScreen Builder is a unique screensaver creation program. CD GUI Builder allows you to design custom CD-ROM Graphical User Interfaces. HelpBuilder - creates help files for Windows 9x, ME, NT, Win2000, XP. PDFBuilderX is an OCX for generating PDF files from an application. Organize and create HTML album for your photos easily and professional. Qweas is providing links to EMCO MSI Package Builder 4.4.8 as a courtesy, and makes no representations regarding EMCO MSI Package Builder or any other applications or any information related thereto. Any questions, complaints or claims regarding this application EMCO MSI Package Builder 4.4.8 must be directed to the appropriate software vendor. You may click the publisher link of EMCO MSI Package Builder on the top of this page to get more details about the vendor.